-Organic hemp oil sourced from Germany & U.K.
Our PurCBD+ phytocannabinoid oil is organic hemp-based and now available in 125mg,250mg and 750mg concentrations. Since we use the purest ingredients, you can rest assured that you’re getting the most potent tincture available at the most affordable price. This phytocannabinoid oil contains 0% THC, the chemical in marijuana that causes the “high” sensation. It’s non-psychoactive and is safe for dogs and cats alike. Just give your pet the recommended dosage depending on his weight. See our comprehensive dosing chart for dosage suggestions. It may take up to two days for results to become apparent. Always ask your vet before discontinuing your pet’s medications or other treatments. Industrial hemp comes from a variety of the Cannabis Sativa L plant. Our plants have concentration levels of 0.3% or less of delta 9 Tetrahydrocannabinol (THC), as defined by the 2014 Federal Farm Bill.Within the Cannabis Sativa L plant are molecules known as phytocannabinoids. All mammals have an endocannabinoid system that is nourished by phytocannabinoids.Non-cannabis plants that contain phytocannabinoids include chocolate (Theobroma cacao), black pepper (Piper nigrum), coneflower (Echinacea), among others.Humans naturally produce the cannabinoids Anandamide and 2-Arachidonoylglycerol (2-AG). Delta 9 Tetrahydrocannabinol (THC) is the only phytocannabinoid that is proven to create a psychoactive effect. In the raw plant state, the THC molecule is confined within a different non-psychoactive phytocannabinoid known as THCA. Our PurCBD oil is non-psychoactive and contains other phytocannabinoids found in the industrial hemp plant including but not limited to phytocannabidiol, which have been reported to have anti-inflammatory, anti-anxiety, and anti-seizure properties. When phytocannabidiol is derived from the seeds and stalks of an industrial hemp plant it is legal in all 50 states,just like any other essential oil such as lavender or peppermint. Due to the influence of big pharma,the FDA has refused (until recently) to investigate the benefits of phytocannabinoid oil for humans or pets. We are not allowed to say or imply that phytocannabinoid has any medical benefits, however the 1st Amendment also protects our right to tell you about our experiences with phytocannabinoid helping our own pets, and the fact that there have been more than 1500 clinical studies regarding the effectiveness of phytocannabinoids. 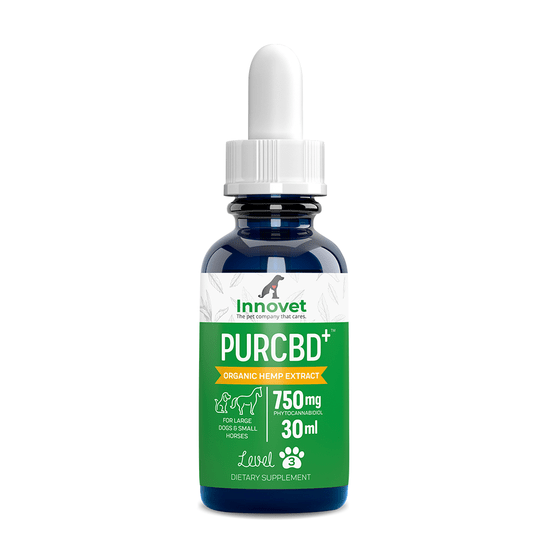 The owners and staff of Innovet believe, but cannot legally claim or imply, that countless dogs and cats have used phytocannabinoid oils for many conditions. There’s a good chance you’ve heard of the myriad benefits cannabis, and more specifically cannabidiol, can have when used in proper dosages by humans. It can be used for treating chronic pain, anxiety, and depression, and even ease the symptoms of cancer. What you may not have heard is how using CBD oil for dogs can have similar positive impacts on the quality of your pet’s life. It can be incredibly disheartening to see our furry friend not enjoying life to the fullest. Even if you’re doing everything right for your pet, sometimes they will still struggle with the same problems we do, like pain, mood issues, and even serious diseases. Fortunately, cannabidiol (also known as CBD) can help your pet through these issues, returning them back to their normal self. 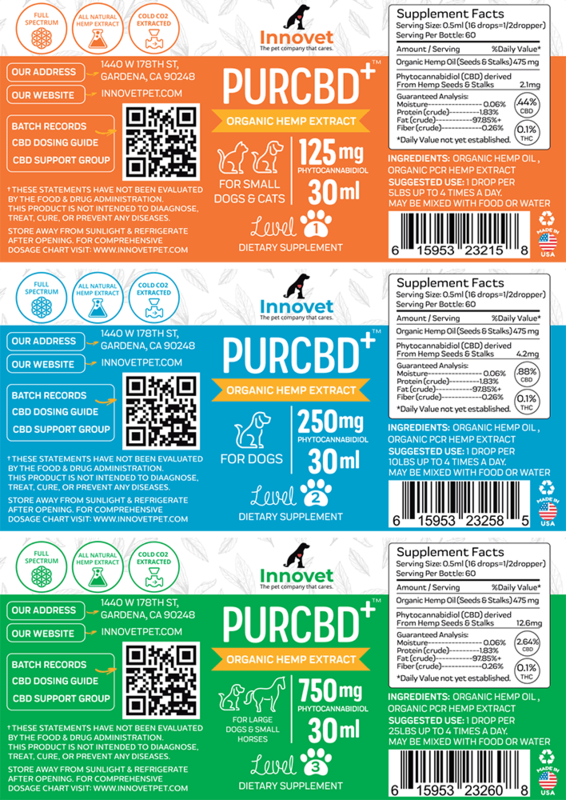 If you’ve been considering using CBD products to help improve your dog’s overall health, this one-stop guide will walk you through all of the concerns you may have and the benefits your animal could gain by using safe, high-quality CBD oils and products. CBD has no psychoactive properties. In fact, if you’re buying high-quality CBD products, the CBD that you give to your dog will have never even come into contact with THC. CBD oil is a highly concentrated form of CBD made by placing a solvent (like olive oil or alcohol) on the surface of a hemp plant. The plant absorbs the solvent, and as it makes its way through the plant it absorbs a high concentration of the CBD compound. The oil is then harvested and processed to create an all natural, non-toxic product that can improve your dog’s well being. Cannabidiol works by supplementing your endocannabinoid system, or ECS. This system is responsible for regulating bodily functions like immunity, sleep, appetite, mood, and pain. It’s made up of neurons in your brain called cannabinoid receptors. Non-THC strains of CBD stimulate these neurons without producing a psychoactive effect; you get the health benefits of hemp without the high. 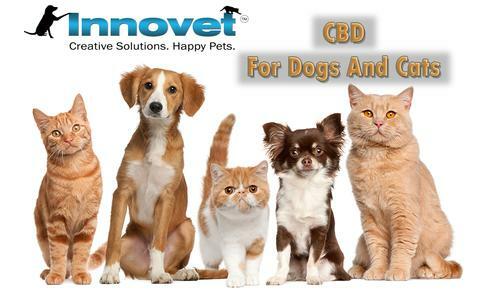 Humans, cats, dogs, as well as birds, reptiles, and mammals, share this system, which is why they are all able to benefit from the effects of CBD. CBD, and more specifically CBD oils, work similar to the way a vitamin works. Taking a Vitamin E supplement works to the benefit of your circulatory system by increasing your body’s Vitamin E supply. CBD oils do just the same for your ECS, which is why it helps regulate mood, pain, and sleep for those with chronic health issues. While the idea of giving your pet CBD oil may seem foreign, it’s very similar to you taking a vitamin. Cannabis oil can be used to treat a multitude of health conditions in dogs. Some of these include seizures, nausea, stress, anxiety, arthritis, chronic pain, symptoms of cancer, and gastrointestinal issues. It’s important to remember that it isn’t a cure for any of these conditions, only a treatment for their symptoms. The most well-known benefit of CBD in both humans and animals is its ability to treat anxiety and depression. If your dog has issues with chewing, urinating, pacing, or other destructive behaviors, then it’s most likely a symptom of anxiety in your pet. Chronic anxiety and depression are generally the result of a hormonal imbalance in your pet. This imbalance can lead to a host of negative symptoms in your dog, including abnormal and destructive behaviors, lethargy, aggressiveness, poor appetite, and poor sleep. Because the ECS system is responsible for regulating mood, sleep, and appetite, using cannabidiol reduces the effect of the symptoms of these conditions. This helps to rebalance your pet and returns their hormones back to a normal rate of fluctuation. CBD also stimulates the adenosine and serotonin receptors in your pet’s brain, which can have long-term benefits for your animal’s happiness levels. Most seizure and epilepsy medication (for humans as well as animals) has severe side effects. Seizures occur when your brain begins misfiring strong electrical signals throughout the body. Standard seizure medications prevent seizures by suppressing the brain’s electrical activity. While this is somewhat effective, users are left feeling dull and lethargic throughout their days, and harm is done to the liver and other organs. Arthritis, back pain, and other chronic pains can all be detrimental to your dog’s quality of life. A common cause behind these issues is inflammation of the joints and their surrounding areas. One healing aspect of CBD is that it can act as a pain reliever, providing quick relief to your pet’s aches. CBD has been shown to have an effect on cancerous cells that prevents them from growing. CBD also boosts the user’s immune system, allowing the body to fight the formation of cancer cells. This means that giving your pet CBD dosages over the course of their life could help lower their chances of developing cancer. For dogs that already have cancer and are being treated, CBD can help counteract the symptoms of the disease and the negative side effects of medications. Using CBD in conjunction with cancer treatment can help improve your animal’s quality of life. There have even been studies in mice and rats showing that CBD can induce cell death in cancerous cells. Despite there not being enough evidence to know why CBD is effective for treating cancer, there is enough to say that it has a positive impact. While you shouldn’t use it in place of traditional cancer treatments, using it alongside these treatments can help your dog through the process. CBD oil can also improve your dog’s coat and skin health. In humans, it is great for reducing symptoms of acne and dry skin, and these sorts of effects carry through to your pets. You can also apply CBD oil directly to your dog’s coat and skin with certain forms of the oil. This will help revive their coat, making it stronger, softer, and shinier. Also, if your pet is suffering from allergies or a skin condition, CBD oil can help alleviate their symptoms and get them back to their usual self. If your dog suffers from inflammatory bowel disease, cannabidiol can help with that as well. This disease is caused by inflammation. Because CBD has the ability to reduce swelling and the discomfort, it can reduce the effects of IBD. It isn’t a cure, but if used with frequency, your dog will be free from most of this disease’s negative side effects. Glaucoma is a condition that worsens your dog’s sight over time. It prevents ocular fluids from draining properly due to high pressure being put on your dog’s eyes. If it’s a chronic condition in your pet, it can lead to partial sight loss or even complete blindness. While any dog can experience glaucoma, there are some breeds that have a much higher chance of getting it. Because CBD can reduce swelling throughout the body, it can ease the pressure that causes glaucoma. This can reduce the effects of glaucoma and help restore your dog’s sight. Even if your pet isn’t suffering from any health issues, CBD supplements can still help to improve their overall well-being. 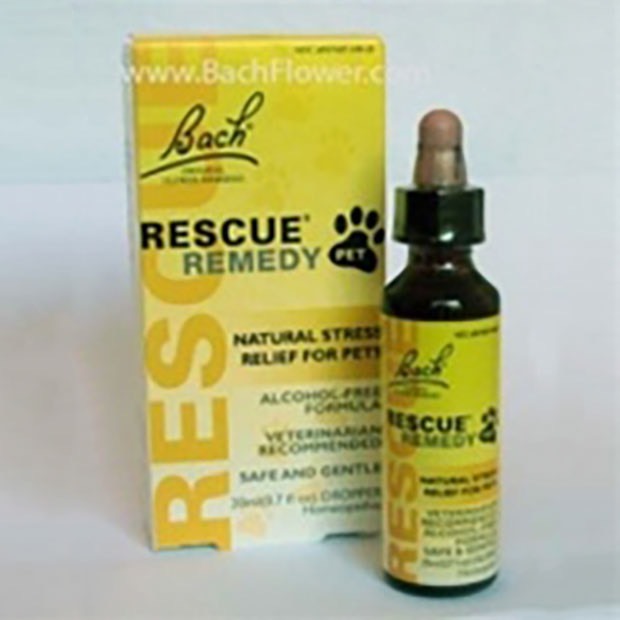 It helps to regulate your dog’s mood, sleep, appetite, and digestion by stimulating the ECS system. It also has a preventative effect on several serious conditions that are common for dogs later in their life. Giving your dog CBD early on can benefit their health and ensure they live a long and happy life. If your dog is suffering from any of these conditions, you may already be considering helping your pet through the use of CBD oil. However, before you give your animal any kind of new medication, it’s important to decide if it’s right for your pet. The best way to determine if CBD oil is right for your dog is by checking in with your local holistic vet. They’ll be able to assess your dog and give you advice on whether or not CBD oil could help, help you determine dosage, and plenty of other useful information. If your dog is on any other kind of medication, check with your vet before giving them CBD supplements. Mixing medications can have serious consequences depending on how the two interact with each other. Giving CBD oil to a dog that is pregnant or nursing isn’t advised since the CBD will transfer to the newborn puppies. In short, no. While it’s a completely reasonable concern to have, CBD oil will not have any psychoactive side effects (so long as it has never come into contact with THC). Hemp, on the other hand, is a strain of cannabis that contains less than 0.3% of THC, which is too low to have any psychoactive effects on the user. While marijuana is currently illegal throughout most of the United States, hemp is legal in all 50 of them. This is why you’ve likely seen hemp lotions and oils in your local grocery stores, and it’s why purchasing CBD oil for your pet is completely legal. Once CBD oil has been extracted from a hemp plant, it’s very easy to package it in a variety of forms. One of the most effective methods for administering CBD to your dog is directly as an oil, or tincture. This produces the quickest results and is the easiest way to control your dog’s dosage. You can give them the oil by mouth, place it on a treat, or mix it into their food. This form of CBD oil for pets is best for dogs with more severe conditions, like seizures, since it is such a concentrated and fast acting solution. CBD oil also comes in topical forms, like salves or creams. If your dog is suffering from skin conditions like rashes or allergies, then this method allows you to apply the CBD directly to the affected area. It’s also good for animals that have acute pains. If you’ve never purchased a CBD product before, it can be intimidating when first faced with all of the different forms, strains, and concentrations. In order to make sure you’re getting the very best you can for your pet, there are a few factors to keep in mind. Most importantly, make sure you never get your pet a CBD product that comes from a marijuana plant or has ever had contact with THC. THC is toxic to dogs, and CBD oil that comes from marijuana plants can carry traces of THC. It’s also important that the CBD product you choose is organic. If the product you purchase isn’t organic, it could contain pesticides, fungicides, or solvents that would be harmful to your animal. If you’re not sure which form of CBD to get for your pet, getting it in a tincture form is a good way to start. It’s the easiest way to control dosages, takes effect quickly, and is a simple way to introduce your pet to CBD supplements. Proper dosage is essential with any kind of medication, and CBD supplements are no exception. Too little, and your dog won’t be able to enjoy the benefits of the medicine. Too much, and they could experience negative side effects. You should also ease your pet into taking CBD. Giving them half dosages at first is a good way to get them accustomed to the medication without overwhelming their system. The best way to determine dosage is to speak with your local holistic vet. They can help you decide how much to give your dog, how often, in what form, and more. 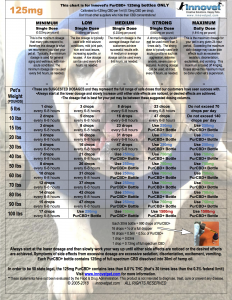 Dosage is generally determined by the weight and size of your dog. A good rule of thumb is to give your dog one drop of CBD oil for every 10 pounds that they weigh. So if your dog ways 30 pounds, you would give them three drops of CBD oil. You should place the tincture under their tongue once a day. You can also check out our CBD Dosage Calculator to help you find the right dosage for your pet. Fortunately, CBD has little to no negative effects on dogs, so you have the ability to increase or decrease the dosage based on their reaction to the supplement. For the first week, monitor your dog’s behavior. If they start to behave unusually or exhibit signs of lethargy, consider lowering the dosage. If they don’t show any improvements over the course of a week, then upping the dosage should help. If you’re considering giving your pet CBD supplements, whether it’s to treat conditions affecting your dog’s quality of life or simply to improve their overall health, then hopefully this article has helped with your decision. If you’re still unsure, talk to your local holistic vet about any concerns you may have. They’re the best way to decide if CBD supplements are right for you and your pet. So long as you purchase CBD products from a reputable seller and are responsible with how you administer it, you should quickly see an improvement in your pet’s everyday life. You’ve probably heard of the many benefits of cannabidiol for humans. It’s been proven to reduce pain, alleviate symptoms of anxiety and depression, and could potentially even help with cancer treatment. Cannabidiol, also known as CBD oil, is one of the active compounds in cannabis. Cannabis has over 100 active compounds, including the major active compound tetrahydrocannabinol; more commonly known as THC. CBD is different from THC in that it doesn’t have any psychoactive effects; it won’t give the user a “high” from using it. Instead, it is primarily used for its health and healing properties. CBD oil is a highly concentrated form of the CBD compound found in hemp, allowing it to be used for medicinal and therapeutic purposes. It’s also known by the more familiar term “tincture”. It is made by passing a solvent (like olive oil or alcohol) to a hemp plant. This solvent makes its way through the plant, absorbing the cannabinoids in the plant. This creates an all natural, non-toxic, and safe medication for giving to your pets. CBD oil is often used to improve the quality of life of cats and ease the symptoms of ailments; it’s important to note that it might not necessarily cure these ailments. So if your feline friend is suffering from more serious issues, taking them to the vet should always be the first step. Not only does your cat have a unique, one of a kind personality, they also have a one of a kind physical make up. Because of this, no two cats will react to CBD exactly the same way. Most holistic veterinarians agree that CBD is generally safe for cats and seldom has any adverse effects. However, you should always consult with your vet before giving your pet any form of new treatment to ensure their safety. Holistic vets are a great option for evaluating whether or not cannabidiol is right for your cat. The biggest safety factor to keep in mind when administering CBD oil for cats is dosage. The most common reason for adverse effects in cats after being given CBD oil is a high dosage. Being aware of the proper dosage for your cat and reading the information that comes with your CBD oil product will help keep your pet safe. Also, while CBD is safe for cats, the marijuana plant is known to be toxic when consumed by cats. Never give your cat marijuana directly; CBD products are the safest way to improve your cat’s health. CBD, and more specifically CBD oils, work similar to the way a vitamin works. Taking a Vitamin E supplement works to the benefit of your circulatory system by increasing your body’s Vitamin E supply. CBD oils do just the same for your ECS, which is why it helps regulate mood, pain, and sleep so well for those with chronic health issues. While the idea of giving your pet CBD oil may seem foreign, it’s similar to you taking a vitamin.Cannabidiol works by supplementing your endocannabinoid systems, or ECS. This system is responsible for regulating bodily functions like immunity, sleep, appetite, mood, and pain. It’s made up of neurons in your brain known as cannabinoid receptors. Non-THC strains of CBD stimulate these neurons without producing a psychoactive effect. So you get the health benefits of hemp without the high. Humans, cats, dogs, as well as birds, reptiles, and mammals, share this system, which is why they are all able to benefit from the effects of CBD. To put it simply, no, it will not. By itself, cannabidiol is non-psychoactive, and will not give your pet, or anyone for that matter, a high. Because it has been separated from the more commonly known active hemp compound THC, it doesn’t produce any of the same effects that THC would. It’s chemically impossible unless you use a CBD oil that has been reintroduced to THC. Not only will it not give your pet a high, but it’s also perfectly legal. While the names hemp, cannabis, and marijuana are frequently interchanged with one another, they don’t all mean the same thing. Understanding the difference is important to understanding their different uses, and which strains are illegal. Cannabis is the blanket term for the plant. It is generally used to encompasses all of the variations and strains of the plant. Marijuana, the most infamous strain of the plant, is the one most people are familiar with. It has a higher concentration of THC, giving it psychoactive properties. Because of this, it is still illegal in most US states and on a federal level. Hemp, on the other hand, only contains 0.2% to 0.3% levels of THC, meaning that it has essentially no psychoactive effects when consumed. Hemp is legal in all 50 states, which is why you’ve probably seen hemp moisturizers, lotions, and other products in local stores before. CBD oil is made from hemp, not marijuana, which is why it is able to be sold throughout the United States. Now, just because marijuana has psychoactive properties, that doesn’t mean that it doesn’t share the same health benefits. Both are able to provide numerous health benefits to users suffering from chronic conditions. However, due to the stigma surrounding the marijuana strain, only hemp products are allowed to be sold in most of the US. That said, CBD oils derived from marijuana plants are not safe for dogs or cats, so make sure that you only give your pet CBD oils that are derived from hemp. The safe forms of CBD oil for your pets should come from hemp plants, not marijuana plants. CBD oil for cats is one of the most popular hemp products available today. It often comes in a liquid, tincture form. Most of the products are in a bottle with a dropper, allowing you to control dosage amounts down to the drop. 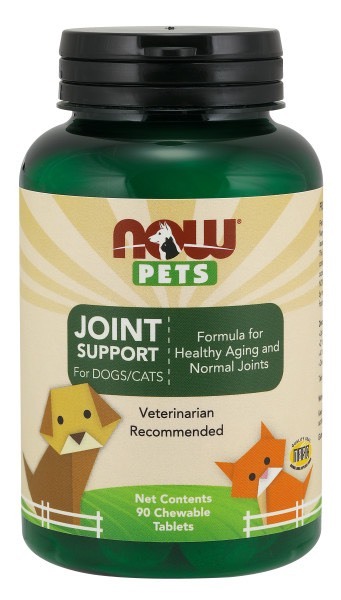 The benefit of this is that you can introduce the cannabidiol into your cat’s diet as slowly or quickly as you like. Even though you may be eager to see your cat’s health improve, adding it into your cat’s routine slowly is often the best route to take. It gives your cat time to adjust to the substance while still seeing the beginnings of improvements. You can administer doses to your cat orally, or by adding small amounts to their favorite foods and treats. Because the endocannabinoid system is shared between cats and humans, the benefits to your cat’s well being will be very similar to the benefits that humans experience when using the oil as well. Not only is it great for treating chronic conditions affecting mood or comfort, but it can also be used as a preventative measure for more serious issues in your pet’s health. Pain and swelling are regulated by the vanilloid receptor in you and your cat’s brains. CBD oils are excellent at treating pain and swelling because they target that receptor and block it from turning on. When this neuron is rendered inactive, it stops sending pain and swelling signals throughout the body, leading the pain points to gradually go away on their own. It works so well that researchers are considering making it a new drug class for treating patients suffering from chronic pain. Anxiety and depression are both caused by a hormonal imbalance in the affected person’s brain. While we commonly think of these as exclusively human problems, cats are susceptible to symptoms of anxiety and depression as well. Because our ECS system is responsible for regulating our mood, sleep, and appetite, using cannabidiol reduces the effect of the symptoms of these disorders. This helps to rebalance the user and returns their hormones back to a normal rate of fluctuation. CBD also stimulates the adenosine and serotonin receptors in your pet’s brain, which can have long-term benefits for your animal’s happiness levels. Not only are CBD oils effective for treating anxiety and depression, but they can also help with other mood or fear issues with your pet. For example, if your cat is afraid of traveling with you in the car, CBD oils can help ease their fear. This way you can both enjoy the trip with less cause for stress. It’s also good for cats that are less friendly towards new people or that spend most of their time hiding throughout the house. Often, this behavior in cats stems from a fear of unfamiliar people, loud noises, or separation anxiety. CBD oil is effective at easing the effects of all of these issues, allowing your cat to play in and enjoy its environment. Seizures are caused by electrical disruptions in the brain. These abrupt changes to your brain’s activity lead to violent shaking throughout the body. CBD counteracts seizures by reducing the number of electrical disruptions throughout the brain every time it is used, giving it a suppressive effect on future seizures. It won’t cure the problem, but it can cut down on how often it happens by a significant amount. This is a breakthrough in seizure medication for several reasons. Anyone who has ever had to take (or knows someone who takes) medication for seizures is likely well aware of the adverse side effects of these medications. It can have a negative impact on mood and energy level, and could even lead to kidney failure, heart failure, or death. Not only that, but it might not even be effective for your cat. As stated previously, each cat has a different health system and tolerance for different medications. Even if you’re giving your pet the right medication with the right dosages, you might not have noticed any reduction in the number of seizures your loved pet experiences. While there haven’t been enough studies to fully understand how or why CBD seems to be an effective method for preventing cancer and reducing its effects, there is a lot of evidence demonstrating its benefits in the area. CBD oil can also improve your cat’s coat and skin health. In humans, it is great for reducing symptoms of acne and dry skin, and these sorts of effects carry through to your pets. You can also apply CBD oil directly to your cat’s coat and skin with certain kinds of the oil. This will help revive their coat, making it stronger, softer, and shinier. Also, if your pet is suffering from allergies or a skin condition, CBD oil can help alleviate their symptoms and get them back to being their usual self. If your cat suffers from inflammatory bowel disease, cannabidiol can help with that as well. Because this disease is caused by inflammation, CBD is useful for treating it thanks to its ability to reduce swelling and the discomfort it causes. It isn’t a cure, but if used with frequency, your cat will be free from most of this disease’s negative side effects. Alongside all of these other benefits, CBD oil is helpful for benefitting your cat’s overall well being. It prevents the development of serious, long-term health issues when introduced into your pet’s diet correctly. It can also improve their mood, skin, fur, and energy levels, giving you and your pet more quality time together. The general consensus among veterinarians is that CBD has little to no adverse side effects in most cats. That said, every cat is different, and will tolerate the effects of CBD oil differently. Make sure you always consult with your local holistic vet before introducing CBD or any other new form of medication into your cat’s routine. The most common side effect that can occur is slight sedation. While it may not be completely obvious at first since cats are known for their affinity towards napping, keep an eye on your cat’s nap schedule after introducing them to CBD for the first time. If you do notice that your cat appears less energetic, reducing the dosage you give them should alleviate symptoms of lethargy. When first starting to introduce CBD oils into your cat’s routine, the old adage “less is more” is the way to go. There is no reason to rush the process by giving your cat large doses to start off with. Easing it into their diet is the best way to go, as they’ll reap the benefits without giving their body any adverse reactions. When trying to determine the correct dosage to give your cat, consult first with your veterinarian. They will be able to give you the best advice on how much your pet should be taking. A general rule of thumb is 1mg to 5mg for every 10lbs that your cat weighs. Starting out with 1mg to 5mg is also good regardless of your cat’s size; from there, you can steadily increase the dosage. Also, consider the amount of CBD a CBD product contains. Often times, sellers will only use a small amount of CBD in their products. This not only reduces the effectiveness of the product but also leaves one to wonder what the rest of the product is made up of.To make sure you’re giving your feline companion the very best it can get, always look for CBD oils that are 100% natural, soy, and GMO-free, and sourced only from hemp plants. When purchasing, do some research on the company you are purchasing from beforehand. This will help you learn from other’s experiences with that company, and you can also see if they have any certifications proving their reputability. If you’re considering using CBD oil to improve your beloved pet’s quality of life, then hopefully this article gave you enough information to help with that decision. While there is a lot of stigma surrounding these kinds of products, most of it is inaccurate, costing pet owners the benefits it can provide to their cats.